Except, man, I haven't had time once this week to eat breakfast before ducking out the door. Not. Once. Too busy packing lunches and stuff - I know I should do that the night before, but where's the challenge then? I'd rather be watching the World Series anyways, to be honest. 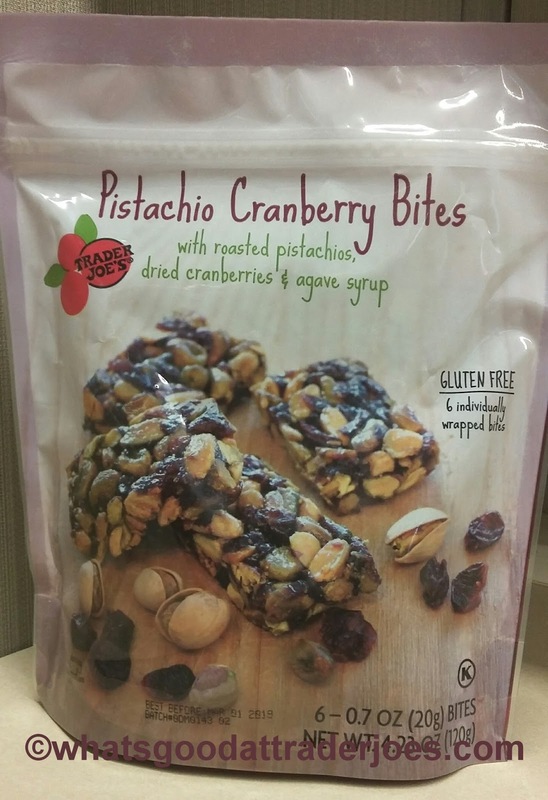 So it's not really a complaint, but knowing this about me in advance, I picked up Trader Joe's Pistachio Cranberry Bites for an easy, on the go, healthyish bite as I zigzag the family minivan here, there, and everywhere across town. It's a good thought. 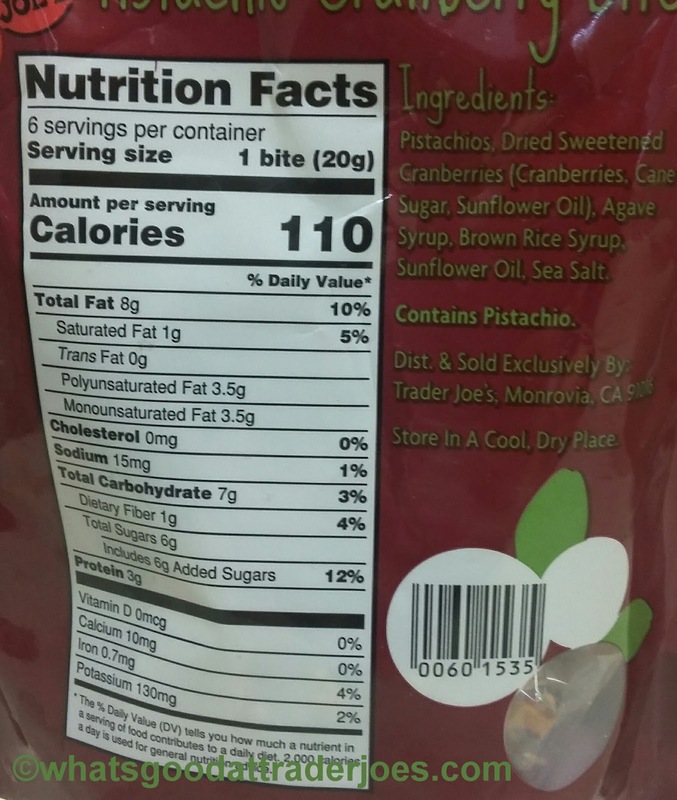 The nut/berry bites are a pretty straightforward construct - roasted pistachios, sweetened dried cranberries, all held together by some rice syrup and magic and all that. The agave syrup adds a slightly sweet and sticky touch, but it's certainly not enough to override the earthy nutty goodness of the pistachios (one of my favorite nuts). The pistachios are the dominant taste, with the cranberries being very second fiddle. I wish they were a little tarter to stand out more. But man...the bites aren't enough. Not at all. Each bar is maybe two measly bites. 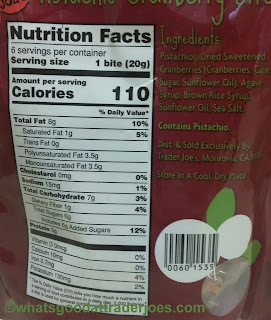 Shoulda figured - the front of the bag says each bite weighs only 20 grams, which isn't exactly a lot - but I guess I was hoping it'd be a hefty 20 grams. No dice. I ended eating three within about an hour's time to try and have some semblance of not being hungry, and it didn't work. Also, as an empty complaint, I hate the fact that they come individually wrapped inside a bigger package. Seems excessive. I mean, I get it, they're all sticky...but shouldn't be a way to cut down on all this? I offer no great solution, so, as I said, it's a pretty empty complaint. I brought them into work, and in place of my lovely wife six time zones away right now, I'm going to have one of my coworkers, Fred, chime in. As one can reasonably expect from a guy named Fred, he tells it as it is. "They're good but..." he said, pausing as thoughtfully as a guy named Fred can, "I need to snack like a man. Those things? They're like two bites! I like the pistachios, though. "Agreed, hombre. A fuller bar version, even for a higher price (nuts ain't cheap, these were like $3) would have been a better snack. It's hard work making a living to financially support a family. It's hard work keeping everyone moving and on time and laundry and meals and dance lessons and...the list goes on. It's hard work trying to balance both. God bless whatever your duty is - I have newfound appreciation for it all this past week. Just wish I picked a more fulfilling snack to help back me up. Eh well. 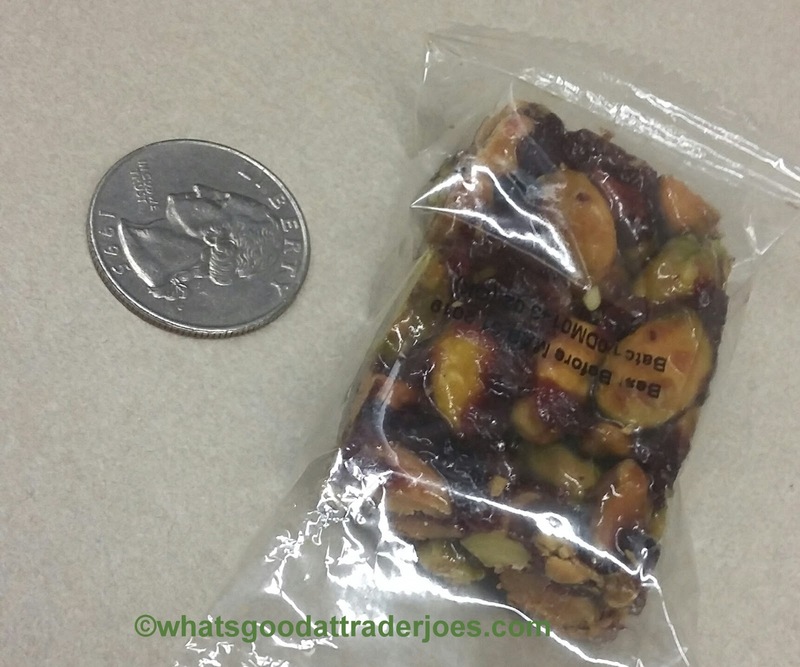 I love nut bars (Kind and Lara bars are my favorites), but I didn’t pick this up after reading that a tiny piece (like you said) is already 110 calories. Not worth it. Have you tried similar ones from Gold Emblem (cvs) brand? or add cherries to the equation. You should definitely throw a parade for Sandy when she gets home ;)) the single parent thing is No Joke! I didn't buy these because i could see the serving was tiny for the calories/fat/protein listed. I can't recall the name but TJs has those nutty chia bars that are like their version of a Kind bar which would work for on the go breakfast. Although when i am on the go and need something serious in my hangry stomach one of the Clif Builder bars works wonders. TJs sells them at a great price, the peanut butter or vanilla almond are great- they're high protein, delicious, and keep you full a few hours. I’ve stopped seeing those mini bite sized bars. Are they still in your area? I think these are fantastic. I will buy more on my next TJ trip. Found a new gig mini bar item. Three varieties.